Although it’s a piece of hardware that polarises opinion amongst the guitar fraternity almost as readily as artificially aged finishes, for this writer, the Bigsby vibrato is as rock ’n’ roll as Keith Richards in a hurricane, and a constant source of musical inspiration. A couple of years of sustained Gretsch (ab)use transformed a Bigsby from a nice-to-have luxury adornment into a must, and the time came to replace the stop-bar on our long-suffering Gibson ES-335 with something altogether more elastic. 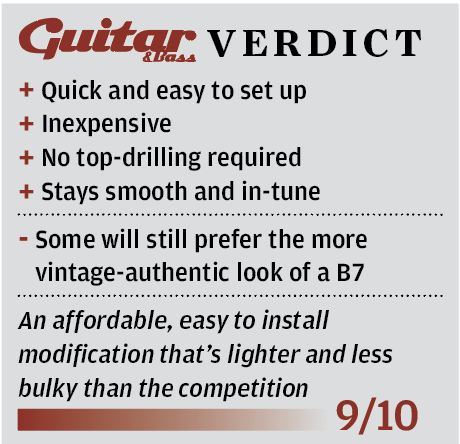 A B7 tailpiece with integrated tension bar was the obvious and mostattractive choice, but it seemed a little gung-ho to drill holes in the Gibson’s attractive flame-top and leave it irreversibly scarred. At this point, many would have opted for a Vibramate kit, but the ES-335 in question is a little on the heavy side already, so adding additional mass on top of the Bigsby itself didn’t seem ideal. Much head-scratching and Googling followed. 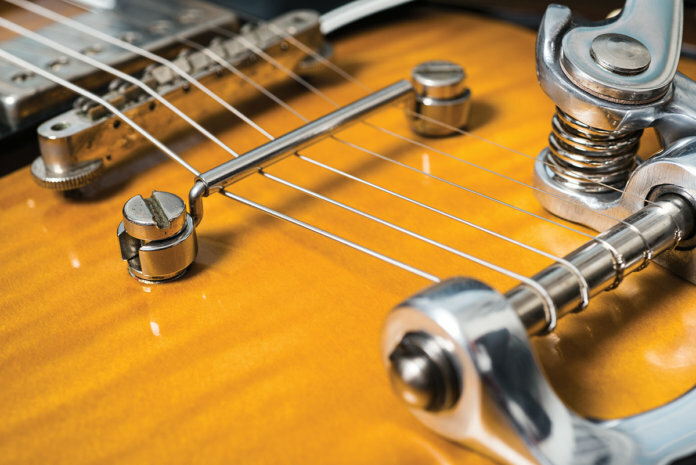 Was there a way to use a Bigsby such as the B3 or B6 that wouldn’t require holes to be drilled in the top, but still maintain an adequate level of tension over the bridge saddles so as to avoid strings jumping out of their notches in the heat of battle? Enter the Towner Down Tension Bar. What is it? Its San Diego-based inventor Christian James Towner takes over the narrative: “I borrowed a friend’s guitar, for about a year, and couldn’t let go. I finally scraped up enough cash to buy a Gibson ES-335 Dot, and shortly after began thinking about installing a Bigsby, simply because I am attracted to the way you can expand the voice of the guitar with the Bigsby vibrato system. “I was looking into the installation and I spoke to a guitar tech. They mentioned installing the Bigsby B3 instead of the B7. This would relieve me from having to drill extra holes in the top of the guitar body. I took their advice, which seemed logical, and installed the Bigsby B3. “Soon after I set up the guitar and began playing, the strings fell off the bridge… the answer came to me immediately because I have a habit of making use of what I already have before asking questions or just throwing money at a challenge. Simply because, most of the time I didn’t have much money to begin with. So, in that moment, I wondered if there was a bar to retrofit to the stop tailpiece studs, looked around for one and found nothing. I was very surprised. “I went around to a machine shop and began fabrication, making my first Down Tension Bar. I installed the first prototype and it did exactly what I needed it to do, keeping the strings in place. From there, I finessed the shape and width. Regular Bigsby B3 and B6 hinge plates have a slot for strap button access, but it can prove fiddly. 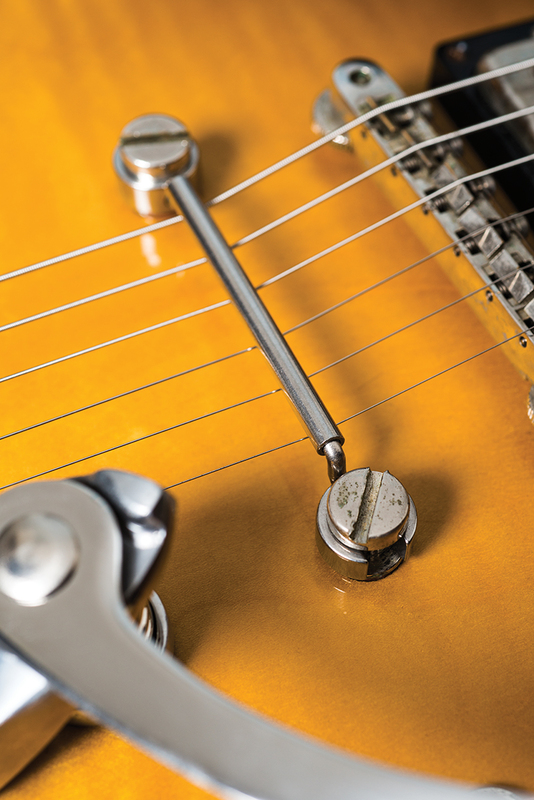 The Towner Down Tension Bar is also available with an adaptor that raises the strap button above the slot and negates the need to drill screw holes in the end of the guitar. Our B6CB’s hinge plate features a simple screw hole rather than a slot, so with the B6CB installed, the strap button sits on top of the hinge plate and access to it isn’t impeded. Small screw holes in the tail of our ES-335 didn’t seem as major an issue as drilling the top, so we opted for the simple £26.95 kit containing the stainless steel Down Tension Bar only. Once the Towner unit is assembled, installation is a breeze. 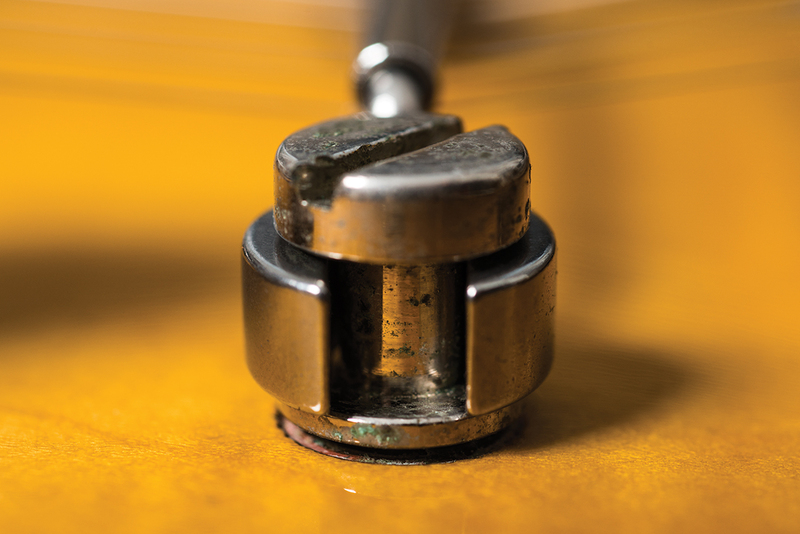 Two pin arms are situated inside either end of a roller bar, and the other ends of the arms connect to anchors that mount onto your guitar’s existing tailpiece studs, as long as they measure no more than 6.73mm at the neck. Once the bar is in place, adjust the downward tension it exerts on your strings to taste, et voilà, it works as advertised. Our strings now behave much as they would with a regular stop-bar tailpiece and, thanks to the roller bar, the feel of the Bigsby is smooth with no perceptible increase in friction. The look is understated and elegant, too. Highly recommended.